If you’re like most people, the main page of your email inbox is a mixture of emails you need to respond to, emails you should respond to, daily deal alerts, and random newsletters you told yourself to read at some point. Go back a page or two, and you’ll find emails you should have responded to, expired daily deal alerts, and random newsletters that will never hold your attention again. Farther back still is the “well, I guess it’s way too late at this point” section of the inbox. And, if you’re like most people, just thinking about your inbox backlog gives you anxiety. There is a better way to deal with your emails. It’s super fast and easy, too! You’ll never have to wonder if you’re forgetting anything because you’ll know what needs to be done at a quick glance. You’ll never have to start an email with “I’m sorry it took so long to respond” again. Inbox Zero means having absolutely no emails in your inbox. Not only that, but maintaining zero emails in your inbox. I believe that this is something that we should all strive to achieve and maintain. It should be the norm rather than a fleeting concept or unsustainable accomplishment. 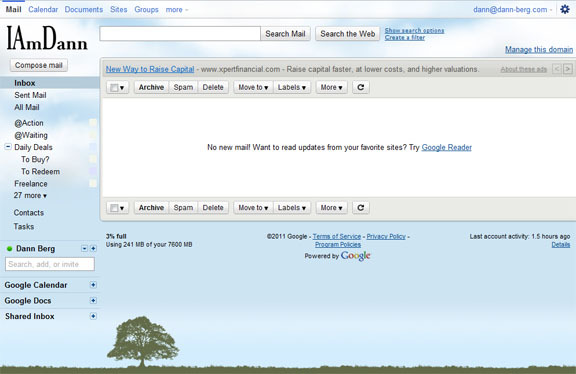 It may seem like a daunting task to even get to inbox zero, let along maintain it, but it’s actually extremely easy. By adding just a few new habits–habits that shouldn’t add more than a minute or two at most to your current schedule–you too can claim inbox zero. I want to walk you through a few tips and tricks I’ve gathered in my journey towards getting things done. First, I want to give credit where credit is due. I have built all of my organizational habits based on David Allen‘s book Getting Things Done. I cannot recommend this book enough. In addition to David Allen, another productivity wizard is Merlin Mann, who actually coined the term inbox zero and runs the blog 43 Folders. In terms of honing your time management skills and exponentially increasing your creative output, there are no better resources. One of the most daunting tasks when tackling a complete organizational overhaul is the email inbox. It is not uncommon to see inboxes with thousands of emails spanning hundreds of pages. Leaving your inbox in this unfiltered state guarantees that an important email will either be missed or forgotten at some point or another (if not on a consistent basis). Setting up an organizational system for your email and maintaining inbox zero allowed you to remain in control of your entire email life. Every email in your inbox falls into one of two categories: action or non-action. Action Emails require physical action. These actions can range from replying to the email to saving an attachment in the email to adding an event to your calendar from the email, or even throwing the email away. Action emails can also have delayed actions. An example of a delayed action email might be an email exchange where you are waiting for a response. If the email does or will require an action, it is an action email. Non-action emails are emails that require no action on your part, but contain information that you want to keep. These can range from order conformations to registration information. Anything that is important to keep, but does not require you to physically do anything. That’s it. That is the only concept you have to master in order to take control of your email inbox. Read and re-read those definitions until you really understand them. Take a look at some emails currently sitting in your inbox until you can easily separate the two. With practice, you’ll be able to tell an action email from a non-action email in a split-second glance. Before I take you, step by step, through the process of reclaiming your inbox sanity I want to explain a pillar of David Allen’s Getting Things Done that had a huge impact on my life. That is the 2 minute rule. This rules states that if an action is going to take two minutes or less, do it immediately. No matter what it is, if it takes less than two minutes, just do it. Outside of your email inbox, this can refer to putting the scissors back into the correct drawer after you use them to quickly rinsing off a dish rather than leaving it in the sink. If it’s going to take less than two minutes, just do it. Now, lets go though, step by step, the easiest way to organize your email inbox and keep it organized. I am going to use Gmail for specific examples for the purposes of this walk-through; however, these general productivity principles can be applied to all email accounts and clients. First, create two new labels, call one “@action” and the other “@reference.” Use the @ symbol so that these labels always appear at the top of your label list. Throughout this post I will be referring to these labels as the “action” label and the “reference” label. Now it’s time to start processing your emails. This sounds scary, but trust me: it’s going to be easy. All you need to do is decide whether the email needs an action or if it’s a non-action message. Yup, that’s it. Just go through your inbox and label every email either “action” or “reference.” After an email is labeled, archive it. If an email does not require any action and you do not need any of the information in the email, delete it. Keep in mind the two minute rule: if the action needed to process the email will take less than two minutes, do it immediately. Examples of two minute actions can include removing yourself from unwanted email newsletters or shooting a quick reply to your out-of-state friend. If you’re processing your inbox and feel like none of the actions would take less than two minutes, grab an egg timer. If you’re anything like me, you’ll be surprised how much can be accomplished in two minutes. The nice thing about Gmail’s archive feature is that you’re able to keep all of your emails (so no need to panic about deleting an important message) yet you can still clear out your inbox for less clutter and ease of mind. Once you have all your emails into one of two categories, it’s easier to see the light at the end of the tunnel. When you click on the label “actions” to view the emails in that category, all that should remain are emails that require some sort of action that will take longer than two minutes. At this point, this should be a manageable chunk of emails. It’s time to buckle down and perform the action required. This will be the most painful part of the entire procedure, and it will actually be a lot more fun than you expect. As you answer each email, remove the “action” tag and add the “reference” tag (if applicable). Do not stop until you get through every single one of your “action” emails. Do not skip over emails you deem unimportant in favor of important emails. Treat each email with the same priority, and get them answered. Congratulations, you have achieved inbox zero. If you’re like me, having a single label to hold all your “reference” emails will simply not suffice. Feel free to break down the “reference” label into smaller categories. I have a label specifically for membership confirmations, one for payment conformations/receipts, and another for website-related emails. Gmail has an outstanding search function, but sometimes it’s nice to be able to specifically reference every website I may have joined. I currently have around thirty different labels. Once you have your labels in place, set up some filters. If you receive a daily email from LivingSocial, set a filter to automatically apply the “Daily Deals” label. Be creative. Are there any emails that you receive on a consistent basis that need to be saved, but do not necessarily require your constant attention? Set a filter to apply a certain label, mark the email as read, and archive it. The email will be around when you need it, but won’t clog up your inbox. There are two different ways to check your email. One can be called Emergency Scanning and the other Processing. Emergency Scanning is when you check your emails but don’t really have time to really perform any of the actions that these emails may require. If you have your email account linked to your phone, every quick glance after a new message alert is an Emergency Scan. Logging into your email account on the computer to verify that there are no urgent matters in your inbox that need immediate attention is Emergency Scanning. Processing, on the other hand, is best done in front of a computer and involves having time and resources to handle all the actions required. This can be anything from unsubscribing to a newsletter you don’t read anymore to working on a project that needs to be emailed to a client/coworker. Organizing and labeling inbox emails are also part of Processing. Use Emergency Scanning as a way to filter out emails that do not need any of your attention. You will receive a good number of emails that do not require any action and you won’t need for later reference. Handle these emails immediately by throwing them away. Did you get a email for a Daily Deal that you’re not interested in? Delete it immediately. It literally takes a second, and it’s one less email to fill up your inbox. If the Daily Deal is something you might be interested in but need more time to think about, feel free to leave it in your inbox for later processing. But if you know that there is NO chance that you will be needing an email, delete it. Move those items to the trash and be done with them. This will leave you with an inbox of emails that really need your attention, either with an action or as reference material. Processing emails will involve two steps: the first is getting your inbox back to zero and the second is tackling your “action”-labeled emails. When you first log into your account for processing, simply go through each email and label them “action” or “reference” and then archive them. Remember, if the action required will take less than two minutes, do it immediately. Then, simply view all emails labeled “action” and start getting them done. Without the distractions of reference emails and unnecessary email that naturally ends up clogging up most of our inboxes, you’ll be able to properly prioritize and never miss an important email or deadline. The most important part of processing your emails is checking the actions label every time you log into your email account. This will consistently remind you of the actions you need to take and allow you to trust your new system. You won’t be tempted to leave an email in your inbox so you “don’t forget it” when you can trust that it will be handled more efficiently if you file it. Any reason to leave an email in your inbox is not actually a reason, it’s an excuse. Organizing your email account is but one tiny step on the way to organization. For further information, I suggest reading David Allen’s Getting Things Done as well as the collective works of the Merlin Mann. Keep in mind, this email organization tutorial is only a brief overview. For my personal account, I have my action label split into two: action and waiting. I also do not have a label called reference, but rather a number of different labels to categorize my archived mail. I also have 36 filters (and counting). I would say about 90% of my email arrives pre-labeled, leaving only a quick decision to delete, archive, or action each new email. By following these steps, you’ll never have to browse page by page through your inbox searching for an email that should have been taken care of weeks ago. You’ll never have to apologize to your dear Aunt Sally for forgetting to give her your new mailing address. You won’t have a panic attack every time you think about page five (or fifty) of your inbox. The air will smell sweeter and the air will taste better. Just think of the delicious air and charge towards inbox zero.